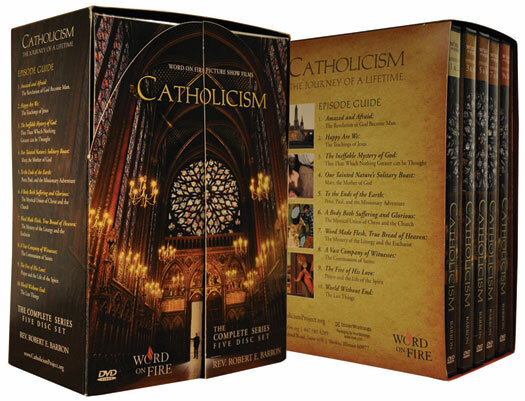 For the first time, in breathtaking, high-definition cinematography, the beauty, goodness and truth of the Catholic Faith are illustrated in a rich, multimedia experience. Journey with acclaimed author, speaker and theologian Fr. Robert Barron to more than 50 locations throughout 15 countries. Be illuminated by the spiritual and artistic treasures of this global culture that claims more than one billion of the earth's people. From the sacred lands of Israel to the beating heart of Uganda...from the glorious shrines of Italy, France, and Spain, to the streets of Mexico, Kolkata, and New York City, the fullness of Catholicism is revealed. The box set includes five DVDs, each containing two full programs. Each program runs 50-60 minutes. This is a Region 1 DVD (playable ONLY in Bermuda, Canada, the Cayman Islands, United States and U.S. territories). plus 1 CD "Hyms & Prayers"
- Biographies of Popes of the twentieth and twenty-first century. - Composite of rare newsreels which highlight significant events in the reigns of these popes. - Bonus feature: 2 films "From the Manger to the Cross" and "Beheld His Glory"